How do you know how good your organisations capability with BizTalk is? Often the answer to this question is not straightforward. There are many different best practices out there and often many of them are not implemented. If your organisation is delivering projects on time and under budget you may think everything is good but as a CTO how do you know your project teams are efficient and how can you be sure your getting a good ROI on your BizTalk investment. This is where a maturity model can help. 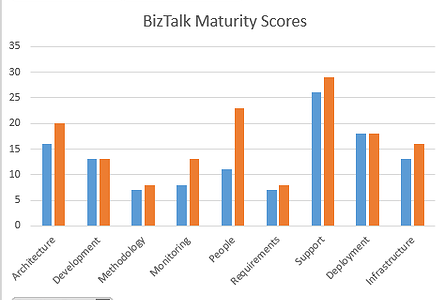 The problem with a traditional maturity model is the grading you assign your organisation is often not based on hard facts and doesnt really handle the fact that you may be more mature in some aspects of the capability to use BizTalk effectively than other areas. This is where the BizTalk Maturity Assessment can help you! If you would like to read some of the theory behing the assessment based on the Behaviour Driven Maturity Model then click the below button to download the whitepaper. The maturity assessment will allow you to compare how your organisation works with many of the common industry best practices. You will then be able to analyse your data to get different views of your maturity in different areas. Once you have measured your capability you can then identify weaknesses and when you implement improvements you can use the Maturity Assessment to measure this improvement. 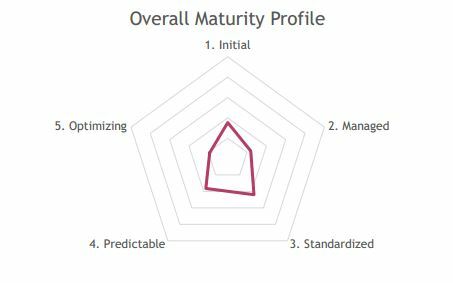 The Maturity Assessment was developed by Michael Stephenson and has been contributed to by some of the most respected professionals and partners in the BizTalk community. To complete the maturity assessment you would complete an extensive set of questions. When complete the analysis spreadsheet will contain some Pivot Tables and Graphs which you can refresh the data for in Excel which will then display the results of the analysis. You will initially get a high level Maturity Scores which are your overall organisational maturity. This is displayed in the below graph. Looking at your maturity in this was is an excellent way to visualize where your current position is over a period of time so you can see the improvements you would be making. This information will allow you to identify the area which are your weaknesses and would be the best candidates for improvement activities. The below graph shows some of this detail. At this point you are in a good position to make decisions over which areas to implement any improvement activities. If you want to look in even more detail at these areas there are additional graphs which show you the scores your organisation obtained for each section out of what is available in the survey. This can also help you to see which are the best areas to invest in to get improvements. The below graph shows what is available at that lower level. 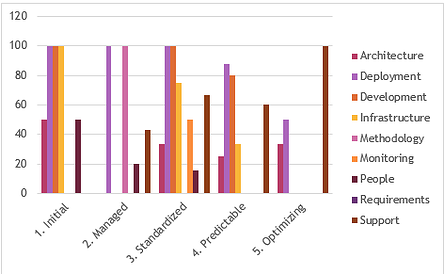 To findout about how BizTalk customers have used the BizTalk Maturity Assessment to measure and improve their capabilities with BizTalk please refer to the case studies.